OSLO, Norway - Africa's first democratically elected female president, a Liberian peace activist and a woman who stood up to Yemen's authoritarian regime won the Nobel Peace Prize on Friday for their work to secure women's rights, which the prize committee described as fundamental to advancing world peace. 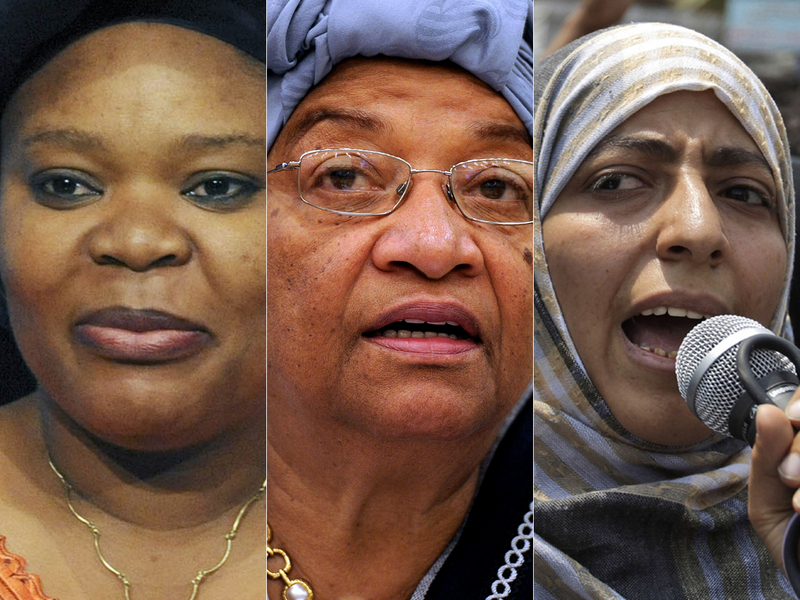 The 10 million kronor ($1.5 million) award was split three ways between Liberian President Ellen Johnson Sirleaf, peace activist Leyma Gbowee from the same African country and democracy activist Tawakkul Karman of Yemen  the first Arab woman to win the prize. CBS News foreign affairs analyst Pamela Falk says this year's Nobel Peace Prize announcement came as a surprise because the lion's share of the awards - 776 to 40 - have gone to men. Falk says the announcement also made a point to draw attention to the United Nations' effort to protect women against violence and in establishing a new division devoted to women in international diplomacy. Liberia was ravaged by civil wars for years until 2003. The drawn-out conflict that began in 1989 left about 200,000 people dead and displaced half the country's population of 3 million. The country  created to settle freed American slaves in 1847  is still struggling to maintain a fragile peace with the help of U.N. peacekeepers. Buttons from her presidential campaign say it all: "Ellen  She's Our Man." On Jan. 23, Karman was arrested at her home. After widespread protests against her detention  it is rare for Yemen women to be taken to jail  she was released early the next day. The peace prize is the only Nobel handed out in Oslo, Norway. The other five awards  in medicine, physics, chemistry, literature and economics  are presented in Stockholm.